Fellow Svengoolie SvenPals everywhere will be jumping for joy about his upcoming showcase of a 1958 monster feature produced by Britain’s Hammer Films. Original 1958 Columbia Pictures/Hammer Films theatrical trailer for “The Revenge of Frankenstein,” introduced by Peter Cushing. The legendary Berwyn/Chicago-based horror film host will showcase “The Revenge of Frankenstein” (1958), this Sat., March 3 at 8 p.m. Eastern/7 p.m. Central on Me-TV. “The Revenge of Frankenstein” (1958) was directed by Terence Fisher, who also worked on Hammer’s “The Curse of Frankenstein” (1957, released by Warner Bros.) and “Horror of Dracula” (1958, released by Universal Studios). The second Hammer “Frankenstein” installment was released in the United States and Britain by Columbia Pictures. 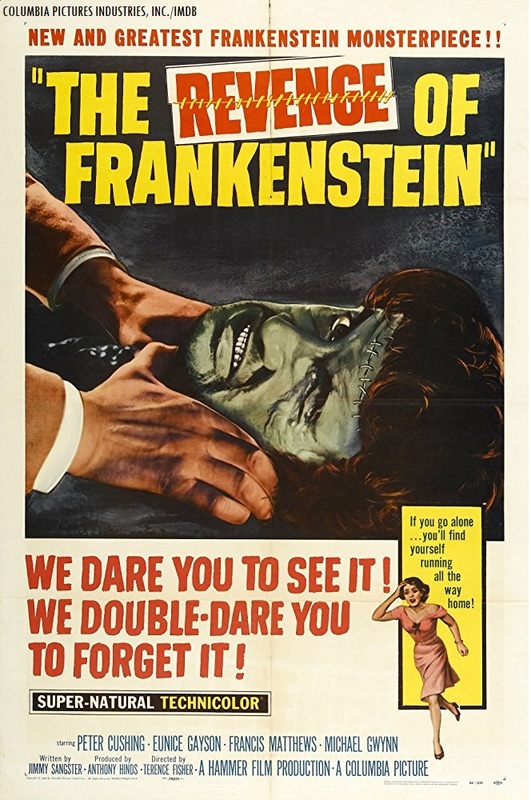 According to the American Film Institute’s film database entry, “The Revenge of Frankenstein” was one of 16 Hammer features distributed by Columbia. Who was in “The Revenge of Frankenstein” (1958)? The players who appeared in Fisher’s 1958 “Frankenstein” monster feature were Peter Cushing (as Baron Frankenstein, a.k.a. Dr. Victor Stein), Francis Matthews (as Dr. Hans Kleve), Eunice Gayson (as Margaret), Michael Gwynn (as Karl), John Welsh (as Bergman), Lionel Jeffries (as Fritz), John Stuart (as the inspector), Arnold Diamond (as Molke), George Woodbridge (as a janitor), and Michael Ripper (as Kurt). Fellow Svengoolie SvenPals will be interested in his upcoming premiere of a 1978 bee thriller from Alan Landsburg Productions. Late 1980s VHS trailer/promotional/preview reel for “Terror Out of the Sky” (1978). The iconic Berwyn/Chicago-based horror host will present his premiere of “Terror Out of the Sky” (1978), this Sat., Feb. 24 at 8 p.m. Eastern/7 p.m. Central on Me-TV. “Terror Out of the Sky” was directed by Lee H. Katzin, who also worked on eleven episodes of “Mission: Impossible” from 1967-68. The screenplay was written by Guerdon Trueblood (who also wrote the screenplay for “Ants!”/”It Happened at Lakewood Manor” and “Tarantulas: The Deadly Cargo”), Doris Silverton and Peter Nelson. Katzin’s film was originally shown on the CBS television network in Dec. 1978, according to IMDB. Who was in “Terror Out of the Sky” (1978)? 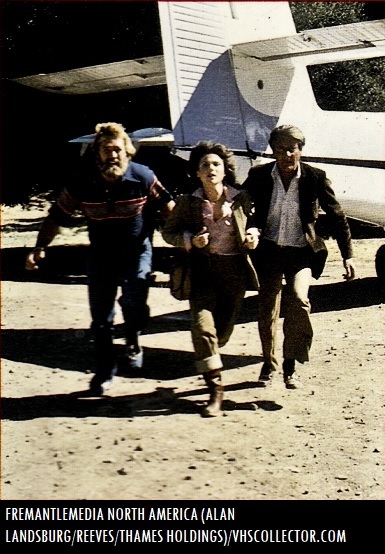 Dan Haggerty, Tovah Feldshuh and Efrem Zimbalist Jr. in “Terror Out of the Sky” (1978). The players who appeared “Terror Out of the Sky” were Efrem Zimbalist Jr. (as David Martin), Dan Haggerty (as Nick Willis), Tovah Feldshuh (as Jeannie Devereux), Lonny Chapman (as Earl Logan), Richard Herd (as Col. Magnus), Ike Eisenmann (as Eric Mangus), Joe E. Tata (as Groves), Charles Hallahan (as the senior Tibbles), Bruce French (as Eli Nathanson), Steve Franken (as Paul Gladstone), Ellen Blake (as an agent), Gwen Van Dam (as Ms. Logan), Norman Gary (as Finley Dermott), Philip Baker Hall (as Starrett) and Poindexter Yothers (as Mike, Yothers was credited as “Poindexter” in the film). One of the definitive cinematic comedies of 1940 with several legends of the silver screen will be returning to select cinemas this month for a limited time. Turner Classic Movies, in association with Fathom Events and Warner Bros. Pictures (as part of the Turner Entertainment/pre-1986 Metro-Goldwyn-Mayer holdings) will present the revival screening of “The Philadelphia Story” (1940). The re-release of “The Philadelphia Story” (1940) will take place in participating cinema locations from coast-to-coast on Sun., Feb. 18 and Wed., Feb. 21 at 2 p.m. and 7 p.m. local time. The re-issue will feature special pre-recorded introduction and concluding statements by TCM host Ben Mankiewicz. 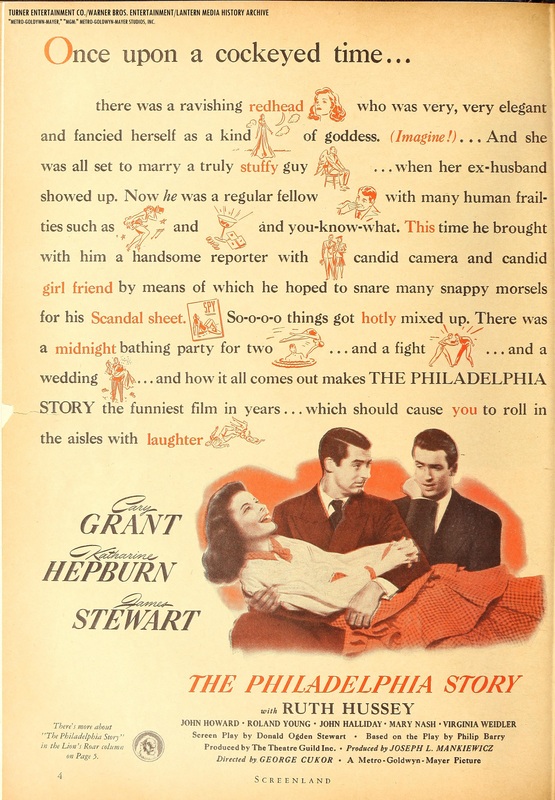 Metro-Goldwyn-Mayer trade ad for “The Philadelphia Story,” published in “Screenland” magazine (for the 1940-41 movie season). Directed by George Cukor, the players who appeared in “The Philadelphia Story” were Cary Grant (as C.K. Dexter Haven), Katherine Hepburn (as Tracy Lord), James Stewart (as Macaulay Connor), Ruth Hussey (as Elizabeth Imbrie), Roland Young (as Uncle Willie), John Howard (as George Kittredge), Virginia Weidler (as Dinah Lord), Mary Nash (as Margaret Lord), John Halliday (as Seth Lord), Henry Daniell (as Sidney Kidd), Lionel Pape (as Edward) and Rex Evans (as Thomas). The screenplay was written Donald Ogden Stewart and was based off of the successful Broadway stage play of the same name by Philip Barry. The screen adaptation was produced by Joseph L. Mankiewicz. Fellow Svengoolie SvenPals everywhere will be looking forward to a 1979 made-for-TV adventure-fantasy entry from Alan Landsburg’s production company. Late 1980s VHS trailer/advertisement/promotional preview reel for “The Mysterious Island of Beautiful Women” (1979). Opening title from “The Mysterious Island of Beautiful Women” (1979). The beloved Berwyn/Chicago-based horror film host will present his premiere of “The Mysterious Island of Beautiful Women” (1979), this Sat., Feb. 17 at 8 p.m. Eastern/7 p.m. Central on Me-TV. “The Mysterious Island of Beautiful Women” was directed by veteran film and television director Joseph Pevney. 22 years earlier, Pevney directed the Universal Studios biopic on Lon Chaney Sr.; “Man of a Thousand Faces” (1957, with James Cagney as the senior Chaney) and the Universal comedy “Tammy and the Bachelor “ (1957, with Debbie Reynolds in the title role of Tammy, Leslie Nielsen as Peter Brent and Walter Brennan as the grandfather). Pevney also directed 11 episodes of Joe Connelly and Bob Mosher‘s “The Munsters” from 1964-66. He also directed 14 episodes of Gene Roddenberry’s “Star Trek” series from 1967-68 (including 1967’s “The Trouble with Tribbles”). The made-for-TV adventure feature originally aired on the CBS television network in Dec. 1979 (according to extended information on IMDB). “The Mysterious Island of Beautiful Women” would be Pevney’s final feature-length production (according to IMDB’s trivia section). Who was in “The Mysterious Island of Beautiful Women” (1979)? The players who appeared in Pevney’s telefilm were Peter Lawford (as Gordon Duvall), Jayne Kennedy (as Chocolate), Clint Walker (as Wendell), Steven Keats (as Mike Stapleton), Jaime Lyn Bauer (as Lizabeth), Michael McGreevey (as Danny), Rosalind Chao (as Flower), Sandy McPeak (as Stu), Kathryn Davis (as Snow), Deborah Shelton (as Bambi), Susie Coelho (as Jo Jo) and Guich Koock (as J.J.). Fellow Svengoolie SvenPals everywhere will be interested in an upcoming premiere of another made-for-TV insect thriller feature from Alan Landsburg’s production company. A brief segment from “Tarantulas: The Deadly Cargo” (1977). 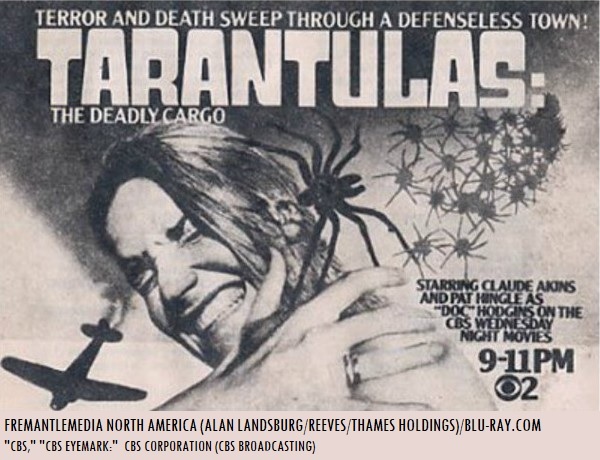 1977 CBS print advertisement for “Tarantulas: The Deadly Cargo.” This was possibly used for CBS O&Os WCBS-TV 2 in New York or KNXT-TV 2 (KCBS-TV 2) in Los Angeles (in the 9 p.m. to 11 p.m. timeframe). The legendary Berwyn/Chicago-based horror film host will present his premiere of “Tarantulas: The Deadly Cargo” (1977) this Sat., Feb. 10 at 8 p.m. Eastern/7 p.m. Central on Me-TV. “Tarantulas: The Deadly Cargo” was directed by Stuart Hagmann, who also directed four episodes of “Mannix” from 1968-69 and three episodes of “Mission: Impossible” in 1969. According to IMDB, this was one of Hagmann’s final films in his directorial career. The screenplay was written by Guerdon Trueblood, who also wrote the screenplay for “Ants!”/”It Happened at Lakewood Manor” (1977, which was recently shown on Sven’s Sat. night showcase). Hagmann’s arachnid telefilm thriller originally premiered on the CBS television network in Dec. 1977 (according to additional details on IMDB). Who was in “Tarantulas: The Deadly Cargo” (1977)? 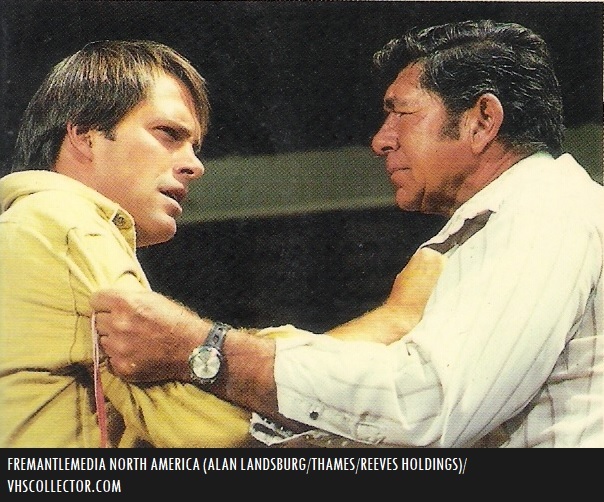 Charles Frank and Claude Akins in “Tarantulas: The Deadly Cargo” (1977).